marshtide | But they call out to me and then I have to take them home. I'm only that bad in the Netherlands, because my feeling of "must! learn! every! bit of this culture! and catch up to those who have been here all their lives!" is only as bad there. I can't emerge from a used book store there without having spent at least twenty euros. Which is actually fine, except that I always eventually have to bring them all back to Canada...ugh. Well, this is mostly my library pile, with a few books that I've begged from people I know here. But still. It's probably too many books for the "current stuff" pile. Oops. But yeah, definitely the must-learn-everything thing as well. Oh man, "Queer Universes"? "Feminism and Science Fiction"? I think I need these books in my life. Books are so good at staring accusingly. I have no idea how, but they are. If I stop by the gay bookshop on my way back from uni today it'll be entirely your fault. New/unread books have some kind of eldritch Lovecraftian power to destroy your brain. I don't even know. Oh, I definitely understand that impulse. And if I really like a book I often want to be able to re-read it and annotate it and so on. Unfortunately my finances don't stretch to books very often at all right now. 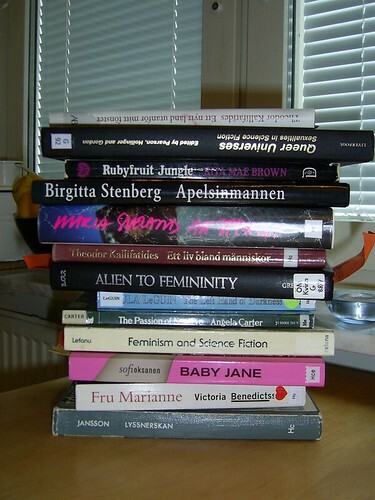 Must.. resist.. the urge to leap for your book pile..
..hey, I think I own Sofi Oksanen's Baby Jane! Frantic book hunting time is obviously at hand. I really enjoyed Baby Jane, in an uncomfortable kind of way. Resisting the urge to dive into piles of books seems to be my life right now. *laughs* The pile keeps getting bigger, too... I mean, I need to read big pule of books! But one at a time is probably a good idea! I still haven't a full Sofi Oksanen-book yet, but from what I saw and from what I've heard "enjoyable but uncomfortable" sums her books up well.